Mélody Braun graduated with a double master’s degree in engineering and management of the environment and sustainable development from both the universities of Troyes (France) and Sherbrooke (Canada) in 2010. She then graduated from Paris 13 university with a master’s degree in humanitarian action and NGOs with a specialization in management of extreme environments, in 2011. She also holds a bachelor’s degree in Earth science. 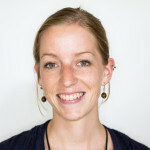 She concentrated her studies on climate impacts, combining both mitigation strategies in developed countries, through industrial ecology, eco-conception, climate action plans in municipalities, and adaptation strategies in developing countries, from the development of adaptation policies at country level to the implementation in the field at community level. She worked in the field of adaptation in Senegal, Togo, Cambodia. She then worked for three years as Climate Change advisor for WorldFish Bangladesh (CGIAR) where she coordinated the pilot Climate Change, Agriculture and Food Security (CCAFS)-funded SmartFarm project and associated research, with a main focus on participatory action research on agriculture, aquaculture and integrated farming systems to identify and develop gender responsive climate-smart technologies at farm and household level. Other duties included the coordination of an IFAD-funded work with the International Research Institute on Climate and Society (IRI) on weather index insurance, the coordination of the preparation a GEF project document for the implementation of a NAPA (National Adaptation Programme of Action) fisheries project commissioned by FAO with the Department of Fisheries, the representation of WorldFish at COP18 in Doha… Finally, she worked as a short term consultant for IFAD to review their “Guidelines for Integrating Climate Change Adaptation and Mitigation Options for Fisheries and Aquaculture into Project Design”. She played an active role in many organizations to raise awareness on environment issues and climate change, and produced a documentary movie in 2009 before and during the COP15, about the role of civil society in UNFCCC negotiations and the expectations from COP15. Since then, she kept following the UNFCCC negotiation process, with occasional attendances to COP or meetings. Mélody Braun is interested in risk reduction and risk transfer strategies for adaptation to climate change, with a strong participatory component, and on how these strategies are impacted by and impact gender roles in a household or a community. She also continues to be interested in mitigation strategies and on how to close energy flow loops within a system and optimize the use of a system’s outputs. She is interested in exploring such options both at higher scale in an industrialized country-based company and at much smaller scale at community or household level in a developing country (through the optimization of water use and nutrients for example). Finally, she keeps following the UNFCCC negotiations, with a particular interest on loss and damage topic (and how weather index insurance could be used as a L&D tool), agriculture and gender issues. Mélody Braun works as a research staff associate on the Financial Instruments Sector Team at the IRI. She participates in the provision of expertise and technical support on climate risk management, weather index insurance design and implementation, and on participatory project design approaches, including interactive games, to international and national partners in West Africa, South and South-East Asia. She also contributes to the development of related materials and research.